We’ve previously written about Sonos and the exceptional sound quality their speakers bring to your home. Now Sonos has created a new device to power your whole-home audio system and integrate with other home automation systems: The Sonos Amp. The Sonos Amp doesn’t project sound on its own, but it can power many speakers with ease. The amp delivers 125 watts per channel and connects to other Sonos speakers over your home network. It also comes with an array of wired inputs, including an HDMI Arc port for TVs. If you have an older model TV, you can still use the Sonos Amp with help from an optical adapter. Because the Sonos Amp can connect to your TV as well as both wired and wireless speakers, it effectively becomes a receiver for your whole audio system. You can stream audio from any input to any speaker in your home, or stream different audio sources to different rooms. The Sonos app for your smartphone makes managing the different inputs simple. And if there’s a song you don’t have in your library, Sonos products work with dozens of audio streaming services. 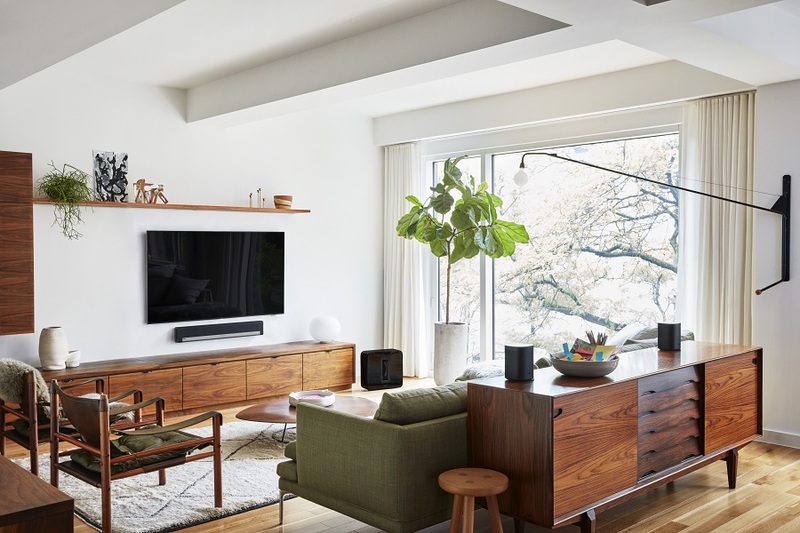 While the Sonos Amp expands what your audio system can do, hidden speakers let you enjoy your favorite audio content without having to find space for speakers or disrupting your interior design. If you’re looking to minimize the presence of technology in your home, consider installing in-wall or in-ceiling speakers. These speakers do require a wired connection, but we can run the wiring through your walls to keep it out of sight. One brand we recommend for hidden speakers is Stealth Acoustics. They have a range of speakers of different sizes and capabilities, making it easy to find a model to fit your spacing and performance specifications. Their LRX83 speakers, for instance, are 22 inches tall, 16 inches wide and weigh only 14 pounds, making them easy to place in your walls or ceiling. We can wire the speakers to your Sonos Amp to get exceptional sound in your main listening space while using Sonos wireless speakers in the rest of your home. Once the wiring is complete, the speakers slide in your wall or ceiling and lie flush against the surface. After the speakers are placed and wired, we paint over the surface to and you get quality sound coming from speakers that are effectively invisible. Hidden speakers like these are well-suited for surround sound installations, as they can be placed behind, to the side or above listeners without taking up space on your floor. The Sonos Amp and hidden speakers can revolutionize how you experience whole home audio. To learn more, call us at (203) 338-0706 or fill out our online contact sheet.